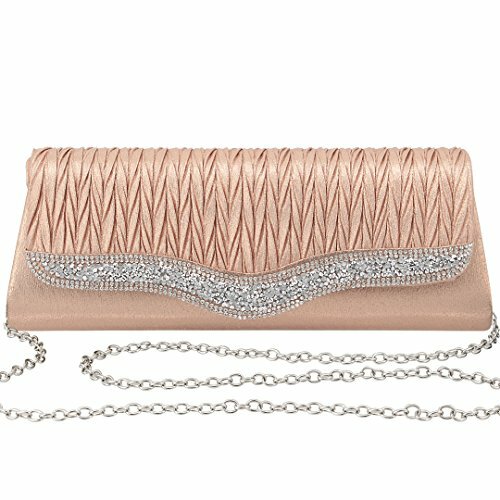 The graceful evening bag is designed with pleated satin and rhinestone flap. Gentle Champagne, Luxurious Gold and Elegant Silver. Surely there's a color suits you. CAPACITY - Large enough to hold essentials like cellphone, keys, cash and so on. PRACTICABILITY - Best gifts and suitable for various occasions. Gabrine is a brand that specialized in evening bags and accessories. We devote to serving customers with high quality products and services. We treat products with heart, hope you have satisfied shopping experiences. please don't hesitate to contact us and we will always be there trying our best to give you a good solution within 24 hours. For damaged products, we can offer you a FULL REFUND or NEW REPLACEMENT. If you don't like this item, you can return intact and get a FULL REFUND, or choose one that you like better in our shop. (Please consult us about the price difference principle). So when you are not satisfied with the product you received, please contact us without hesitation and we assure that you will get a contented solution. To avoid the problem of return caused by the size, please take a rough measurement by yourself before purchase! The new bag will be little smelly, we suggest you put it in a well-ventilated place for a few days then the smell will disappear. With the difference in the measurement method, please allow 0.3-0.8" in size deviation. Due to monitor variations, the picture may appear slightly different from the actual color of the item. Thank you for your understanding. Wish you a happy life! FEATURES - Use the design of pleated satin and rhinestone flap. Also features high-quality comfortable PU leather, magnetic hasp closure, polyester lining and a small pocket inside. FUCTIONALITY - Comes with a long detachable silver-tone chain which offers versatile carrying options as clutch, handbag, shoulder bag or crossbody bag. So roomy a bag that it is large enough to hold essentials like mobile phone, cards, cash, car keys, small wallet, mirror, lipstick and some makeups. LIFETIME GUARANTEE - For damaged products, we can offer you a FULL REFUND or NEW REPLACEMENT. If you don't like this item, you can return intact and get a FULL REFUND, or choose one that you like better in our shop(Please consult us about the price difference principle). So when you are not satisfied with the product you received, please contact us without hesitation and we assure that you will get a contented solution. If you have any questions about this product by Gabrine, contact us by completing and submitting the form below. If you are looking for a specif part number, please include it with your message.